This is the only nebulizer that will work at a 90 degree angle. Easy-to-use, hand-held and disposable. Compatible with all portable compressors. Offers faster nebulization time with greater particle density. 6cc capacity jar with threaded cap to prevent leakage. 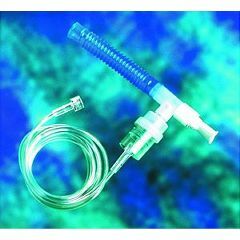 Complete with 84" oxygen tubing, "T" and mouthpiece. Easy To Use. Lightweight. Good Value. Effective. I use this product up to 4X per day. Easy to clean and great price. nebulize with albuterall and acetycistien. Exactly what I wanted and performs just like it said. I use this product every morning and every evening and it is proved to be very efficient and effective. where do you put the albuterol? The top unscrews and you put the albuterol in the clear cup, replace the top, and you are good to go. Will this Micro Mist Nebulizer work with a proneb machine? Yes it will work. The connection is universal and usually fits any compressor. Is this part compatable with a Pacifica Compressor Nebulizer Model 18060? Is the Hudson RCI Micro Mist Nebulizer compatible with a Sunrise 2655 Compressor which has a max compressor pressure of 35 psig and a compressor free air flow of 8 lpm. do you sale nebulizer pars without a prescription?